My grandma once remarked (in Vietnamese, of course) that in New York City, money is spent as freely as water. From dining to shopping to transportation to entertainment, it’s dangerously easy to drop some serious change exploring and reveling in everything the city has to offer. While bargains may not be the norm in these here parts, there are still some great values to be had. 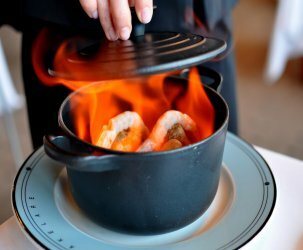 Take for instance lunch at Del Posto, Chef Mario Batali and restauranteur Joseph Bastianich‘s four-star Italian restaurant. 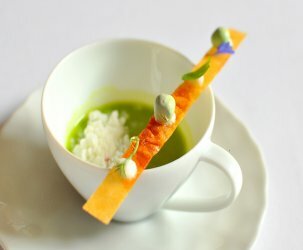 Dinner here starts at $115, but a three-course lunch complete with amuses and mignardises can be had for just $29. 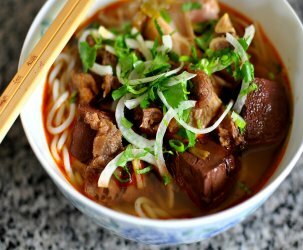 Now, that’s a deal that even my penny pinching Bà Ngoại would approve. The Astronomer and I lunched here the afternoon following our feast at Eleven Madison Park. 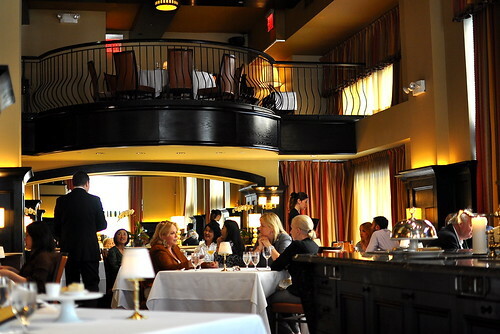 We were seated at a table fit for four in the center of the dining room. The crowd of lunching ladies and powwowing business types spoke mostly in hushed tones, adding to the formal ambiance that I found too stuffy for this time of day. After placing our orders, a server brought over a trio of amuse bouches. 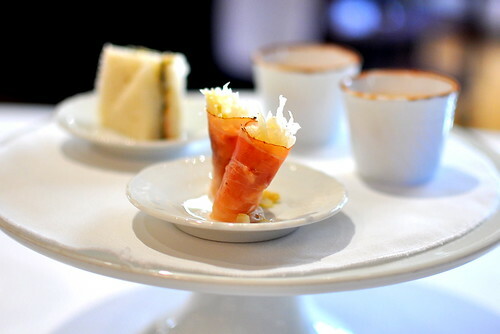 There were lobster and caviar finger sandwiches, a tomato soup with bread crumbs around the rim, and small bundles of sauerkraut wrapped in speck ham. All three bites were perfectly nice, but none were particularly wow inducing. Following our amuses, a basket filled with olive rolls, baguettes, and focaccia came our way. 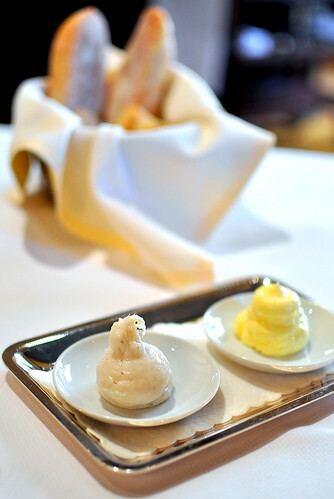 The warm and toasty breads paired brilliantly with the accompanying lardo and butter. The Astronomer and I were completely seduced by the lardo, luscious back fat cured with rosemary and garlic. If I ruled the world, every bread basket would come with a dish of lardo. 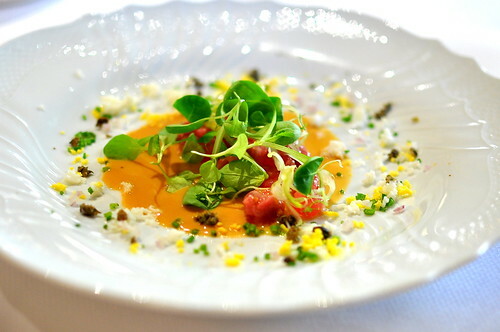 From the “antipasti” portion of the menu, I chose the raw veal and tuna cubetti (cubes) with mustard and fennel hearts. Eating raw fish in tandem with raw meat was a novel and delicious experience. 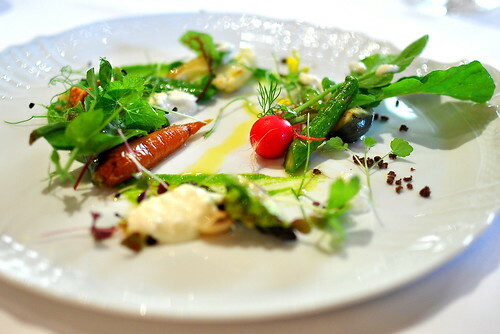 The Astronomer chose the insalata primavera della terra, a landscape of seasonal vegetables, fresh greens, rye “dirt,” and rosemary crumbles with a sheep’s milk ricotta dressing. The Astronomer was pleased with his fresh and snappy plate of edible earth. For the second course, The Astronomer and I both passed over the secondi (meat) options and set our sights on the primi (pasta). 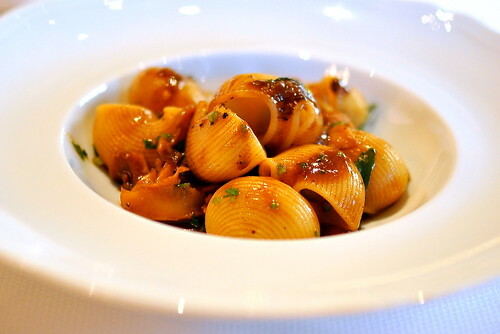 My scungilli due featured tender marine snails nestled against snail-shaped pasta. The snails “two ways” were seasoned with black garlic, black pepper, lemon, and parsley. I appreciated the dish’s playfulness, but found the flavors a little muted. 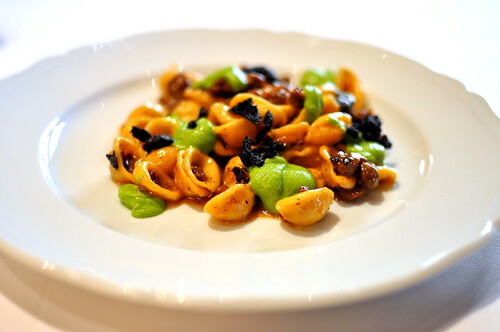 The Astronomer’s handmade orecchiette with lamb shoulder sausage, crispy morels, and minted soybeans was absolutely wonderful. The combination of minty puree with gamey sausage couldn’t be beat. 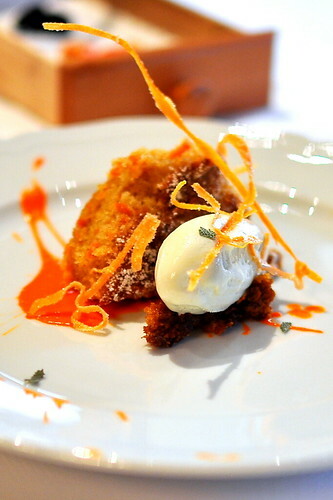 For dessert, we picked the torta carotina (carrot cake) with sage gelato and carrot croccante (brittle). The plating was abstract, but the flavors were straightforward. Our spoons were fighting over the last of the herb-infused gelato. 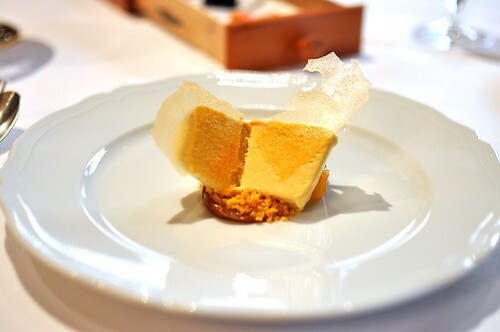 The butterscotch semifredo, which was served with melon agrumata (oil), sbrisolona (crumbly cake), and milk jam was also quite good, but lacked that sweet oomph that I look for in butterscotch flavored desserts. 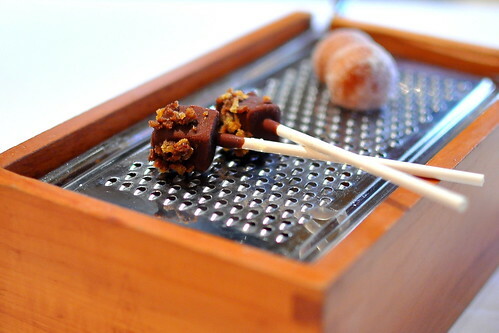 Finally, a cheese grater filled with sweet nibbles—warm bomboloni (doughnuts), chocolate covered olive oil popsicles, candied grapefruit dipped in Amaretti crumbs and caramel, and bitter chocolate truffles. Yep, Grandma would definitely approve of this midday indulgence. I got seduced by that lardo once. you go, cc. I love the lardo too! Man, the lardo seems to be the winner of this lunch – it really is a sensational lunchtime deal, too! 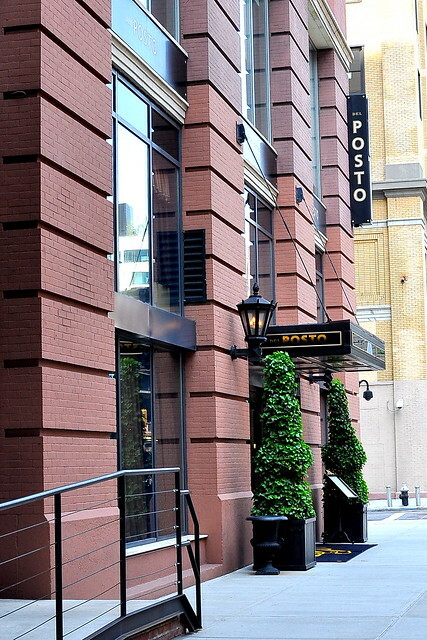 I went to Del Posto last year for dinner – I had those same lovely lardos. I agree that the ambiance seemed rather stuffy – even for dinner. It was like where Wall Street guys with the fancy socks dined. Wish I could have tried the snail tandem dish! lardo. not quite sure i’ve tried….hmmm…. Was the olive oil lollipop liquidy on the inside like Gushers? Tsz – It was more like creamy and cold olive oil gelato. Gushers would’ve been awesome though!